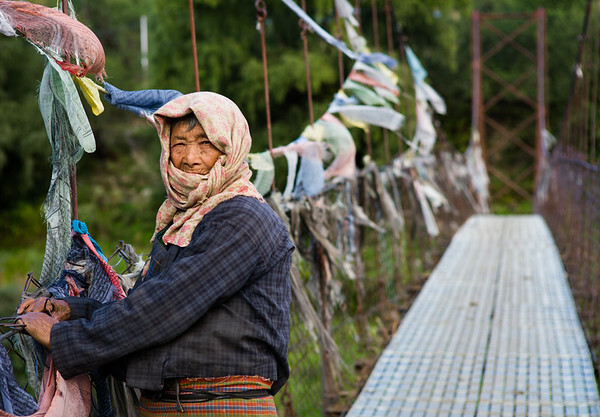 People make a country, and this is especially true in Bhutan, the country that measures Gross National Happiness. I’m one to normally photograph people, but I could not resist while in Bhutan, where the people are warm and welcoming. Up a narrow, steep, wooden staircase, where each step has been worn smooth over the years, this doorway leads to a small temple. The man had just unlocked the door and lit a few butter candles on the alter before coming out. I was fascinated by the colors and detail around the doorframe, and had already set up my tripod and camera to capture this when the man appeared. He must have been surprised by my tripod because he stopped dead in his tracks just as I pushed the shutter. I was certain he would move during the 1.5 second exposure, but he remained almost perfectly still without being asked. One of those instances where luck played a huge role in getting the shot. Another shot from inside the monastery school in Thimphu, where I was surrounded by novice monks during their study break. I'm not sure what these two young boys were looking at; maybe my guide was talking with them, but they sure look enthralled in whatever is being said. These kids were great and very kind. Each wanted their picture taken, some more than once, I spent about 45 minutes in this room taking pictures, and loved every second of it. 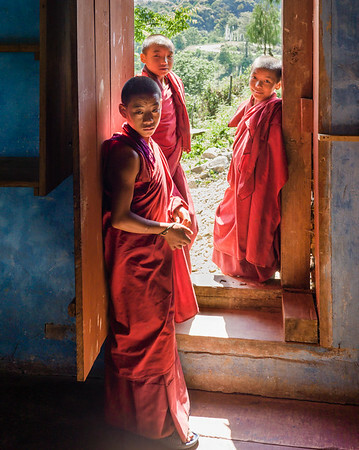 A young monastery school for novice monks in Thimphu was an unexpected treat during my first visit to Bhutan. I thought the school would be nothing special photographically, but we got permission to visit one of the classrooms where the young monks were engaged in a study hour. Almost as soon as we entered the room, pure pandemonium broke out as every monk wanted their picture taken. About half the students swarmed around me as I tired to take as many pictures as possible without asking the monks to pose. Eventually, as the excitement died down, I found these two monks in a corner of the room. The monk in the foreground is looking at a picture of himself he was just given, probably the first picture he's ever seen of himself. 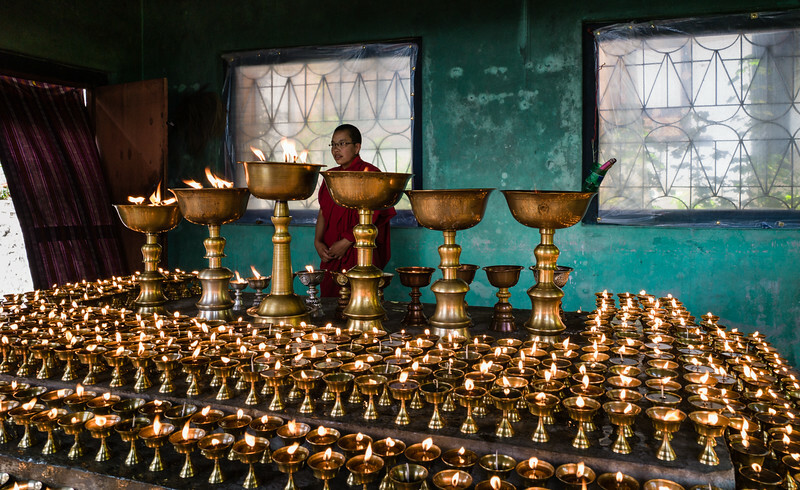 Located on a hilltop in the town of Mongar, this old temple was a real treat. I remember exploring the interior of the temple (located just to the right of this image) and coming out to find this scene unfolding before my eyes. 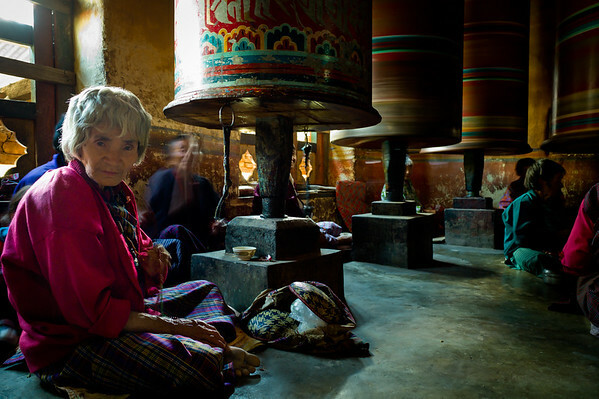 Maybe 10 or so older women were sitting in the anteroom outside the temple, a room with four or five large prayer wheels. It seemed this was a daily gathering, where the women came each morning to socialize and pray at the same time. I worked the scene from various angles before finally sitting down on the floor, lowering the tripod almost as low as it would go, and framing this image. Despite the windows the room was very dark, yet the shadows held an incredible amount of details in color. I used a long exposure to get enough light, which also captured the movement of several of the large prayer wheels and even some of the people. Thankfully, the woman closest to me actually stayed still while the shutter was open. This is a secret location in the middle of Bhutan. This building is part of a small temple complex, but unless you knew what was inside the building you wouldn't bother trying to get the door unlocked. Luckily we knew what was inside, and it was incredible to experience. 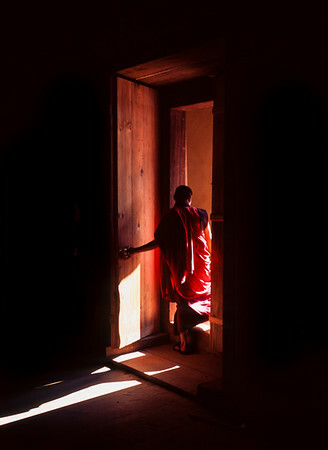 Then, these three novice monks who had been watching us with keen interest, opened the back door and stood in the doorway. The bright Spring sun streamed in from outside, and helped illuminate not only the monks' scarlet robes but also the beautiful blue interior wall. 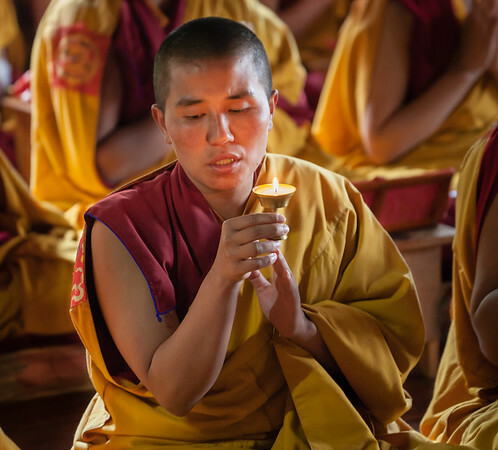 I think the monks had a great time watching us photographing the room and its contents, and they eagerly accepted a few items of food and a little money for helping us out. Just minutes after setting out on the hike up from the valley floor to the village of Ogyen Choling, I came to this wobbly suspension bridge spanning a cold, swift moving river. This woman was on the bridge, moving in neither direction, staring out at the water moving towards and then under her. As I took the first step onto the bridge she became altered to my presence and looked in my direction. I was already prepared, hoping to capture an image with her looking out over the river. Instead, I got this shot with her looking right at me, the eyes weathered and skeptical, the skin hardened by years in the harsh Himalayan sun. On the way down during my first hike to Tiger's Nest, I came back to a great viewing point where the splendor of the temple can be viewed in all its glory. 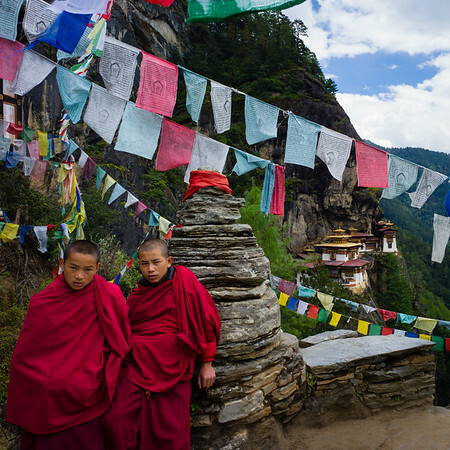 As I approached, I could see two young monks also enjoying the sights and admiring Tiger's Nest. After asking through my guide, the monks agreed to let me take their picture with the temple as the background. I don't normally do these types of images, but in this case I think it was worth it: the red robes, the shaved heads, the colorful prayer flags, and the temple perched on the mountainside. Located an hour or so south of Trongsa, Bhutan, this wonderful nunnery was a visual feast of color, light, and people. After lunch, just three of us visited the nunnery and had the temple all to ourselves. We could move amongst the praying nuns, and photograph anything except the alter. Row after row of yellow and maroon clad nuns were deep into their worship program, and took little notice of us as we moved quietly throughout their ranks. It was one of those experiences that I had dreamed of seeing and photographing, and it had happened almost entire by luck. Isn't that how things frequently happen? We arrived at one of Bumtang's oldest temples the day before a large festival was slated to being. Not only were preparations well under way, but people had shown up this day for some pre-festival celebrations and prayer. I worked my way around the outside of the building, shooting inwards through the windows, before finally going inside to capture this group of men sitting around the perimeter of the room. 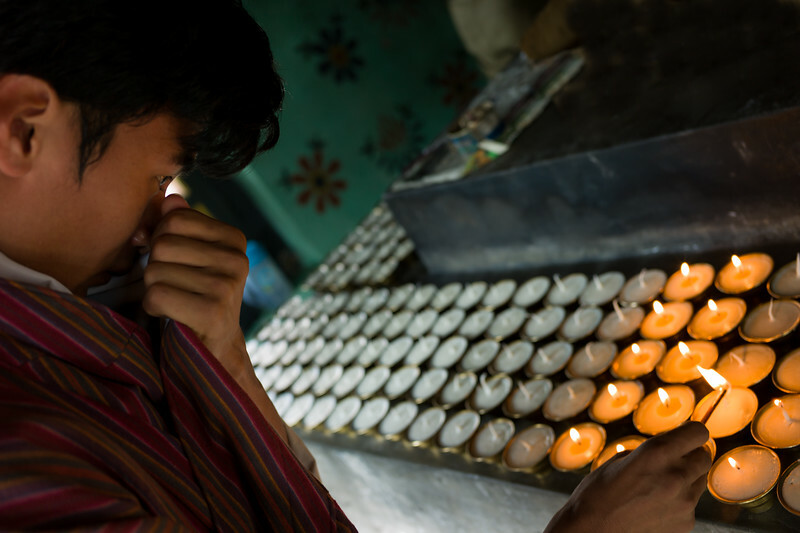 Each had their own little prayer wheel, and were spinning them constantly. 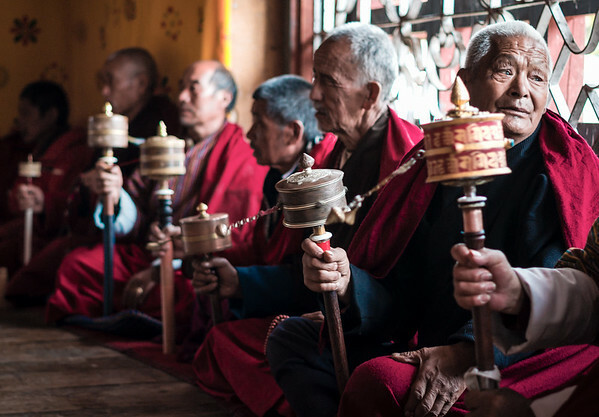 I really just liked how the men were all lined up, each with their own prayer wheel, but how each of the wheels were spinning at about the same speed. South of Trongsa is an incredible nunnery. Aged and unique, this nunnery is a relatively large complex built on the top of a hill. 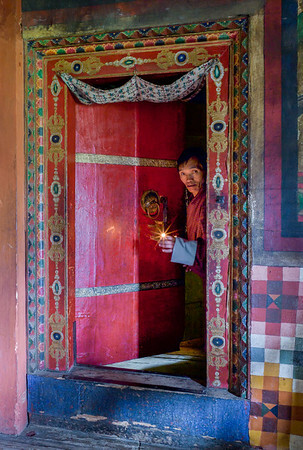 Outside the main temple building, this butter candle room was small and hot, both from the number of photographers inside and the numerous lit candles. No room for tripods in the room, and so I handheld the camera as steadily as I could as this nun moved around behind all the candles. I loved photographing inside these types of rooms, but in this case I thought the far wall, with its uneven color and flanked by the plastic covered windows. The nun was incredibly kind, and lit several more of the candles for us, even as the door remained open and the wind blew into the room. During a break from a wonderful festival in Bumtang, I took 30 minutes or so and walked behind the main temple to see more of the area. I found several sets of kids playing in that area, and also came across a older man who was circumambulating the temple several times. 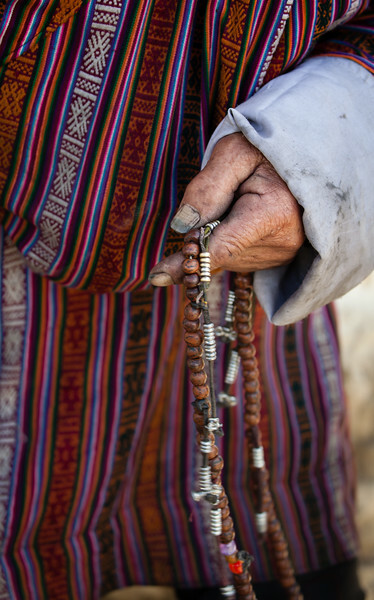 On his second time around I stopped him and asked to take a picture of his prayer beads. What really captured my attention was his hands, which look as if they have had a hard life, one filled with lots of manual labor and very little creature comforts. What a life.